A question in Parliament has raised hope that Government money could be found for an A6 Kibworth bypass. The question was asked by Harborough MP Neil O’Brien, who said the road in Kibworth had “a major problem with air quality and congestion every morning”. The Minister replied that the Major Road Network Fund would enable the government to deal with problems like the one in Kibworth. “The A6 is one of the roads I expect to be eligible for that fund,” Mr Grayling said. The whole exchange in the House of Commons last week lasted less than 30 seconds. 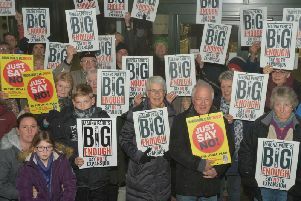 But it represents at least a ray of hope that the Government will find money for a new bypass that would take through traffic out of the centre of Kibworth, ending at a stroke both an air quality black spot and daily congestion in the village. But he said even if the A6 Kibworth bypass is on the Government list of potential road schemes when it is announced next year, a £30m-£40m bypass is still years away.